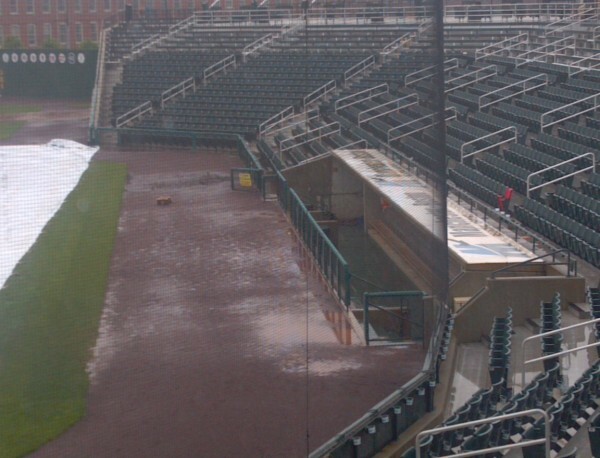 he America East championship baseball game pitting UMaine against Binghamton was postponed Saturday, May 25, because of bad weather conditions. The America East Conference baseball season came to a close Saturday by virtue of league champion Binghamton’s 8-4 loss to Ole Miss in the NCAA Durham (N.C.) Regional. The Bearcats dropped both contests, losing their opener 4-1 to seventh-ranked regional host North Carolina State on Friday. With the season complete, America East needs to rethink its approach to the conference championship tournament. The right to host the America East Baseball Championship should be awarded to the regular-season champion, as had been the practice for several years. The beauty of that dynamic is that it rewards the regular-season winner for its play during what this year was a 10-week regular season. This spring, UMaine claimed the regular-season title — all so it could ride the bus more than 3 1/2 hours to play at LeLacheur Park in Lowell, Mass. While playing in the backyard of incoming league member UMass Lowell was a nice gesture and provided a more central location, it was not conducive to a great tournament. First of all, crowds were generally small, 100-300 fans. Playing at or near a campus site would at least generate some local interest and enthusiasm for the home team. Another issue was playing on a grass field during what turned out to be a rainy stretch of weather. That meant the umpires and grounds crew often had to work around the conditions by deciding when to tarp the infield or when to apply drying agent on the wet surfaces. Officials did a commendable job of keeping the field in decent condition, although an artificial surface would be preferable and could have handled more water. Other issues involving the weather could have been avoided by scheduling games at more reasonable times. Games were slated each day at 4 p.m. and 8 p.m., with an 8 p.m. if-necessary title game. That backed tournament organizers into a corner where the second game of the day was concerned. UMaine’s second-round game on Friday of the tournament was scheduled to start at 8 p.m., but a rain delay during the 4 p.m. game meant the first pitch wasn’t actually thrown until 9 p.m. Ultimately, the conditions were deemed unplayable and the contest was suspended, in the seventh inning, at nearly 11:30 p.m.
As a result, UMaine and Binghamton were forced to come back and resume that game at 2 p.m. the next day. The Black Bears, who lost, then played at 4 p.m. before meeting the Bearcats again in a championship-round game at 8 p.m. They spent nearly 12 hours at the ballpark that day. On both the second and third days of the tournament, the weather was better during much of the day than it was at the scheduled game times. Playing the games at noon and 4 p.m., or 11 a.m. and 3 p.m., would have prevented the aforementioned late-night situation the teams endured. Earlier game times also provide a greater window for being able to work around weather and field issues. America East also rolled the dice in regard to its booking of LeLacheur Park for the tournament. It turned out the facility was not available during the day Saturday, nor at all on Sunday, forcing organizers to secure an alternate site for the championship game. The conference should be commended for procuring a suitable, artificial-turf playing facility at the University of Rhode Island, where two or three brief rain showers and a steady wind were the only obstacles in the championship game. That said, America East coaches and administrators should vote to play the tournament at the home site of the regular-season winner — or a suitable facility nearby — with games scheduled at noon and 4 p.m.
That would be a better scenario for all involved.